MAKING A MARK: Which sketchbook? I've been writing my next book review, of Drawing from Life - the Journal as Art and got distracted into thinking about sketchbooks! I guess reading all these materials pages at the front end of these drawing books that I'm reviewing and then looking at 30 odd journals is beginning to make me think more about how I can solve my problem. My current objective is to find a way of being able to draw on a larger piece of paper with a view to sales. (I know, I know - taking leaves out of sketchbooks - complete heresy!) I guess what I'm looking for is something which feels like a sketchbook but isn't - it's full of loose paper suitable for final works - except in my case it'll be a sketch done while travelling. The very boring picture on my right is something I bought years and years ago and have never used. It's a Roberson's Artists Paper Choice cover. It has two of those 'screw post thingies' into one end of the front and back boards which are covered with that very fine material used for binding books, a wide elasticated band around it - and it just needs to be filled with paper! Which will probably be Arches Hot Press cut to size - and that size will be no bigger than 11"x8". I found the Roberson website (see below) and, no, they don't seem to produce what I've got any more. However I'm going to check as essentially it's the front and back boards of their watercolour sketchbooks - which colourwise and size wise look very much like the ones endorsed by the Royal Watercolour Society (and available to buy at the shop at the Bankside Gallery). Which means they may be able to do me an A3 size - which is what I'm really after! So - one step further on the track of the sketchbook holy grail. Daler Rowney Black Hardback Sketch Book. I use both the A4, A5 and A6 sizes - but mainly the A4 size. These are the sketchbooks which work particularly well with pen and ink and coloured pencil. These sketchbooks contain 78 perforated sheets of Ivory Cartridge paper 85g/m which is acid free (this means the paper never yellows). The perforation near the binding edge means the perforation can be folded to either remove the page easily or to make a double page spread which lies flat. 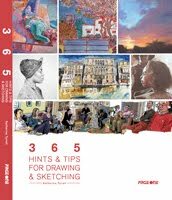 All my largest sketches are currently done as a double page spread in this book. The 11"x 16" is a size I'm happy working at - but I just wish it didn't have the fold line down the middle - hence the search for the new sketchbook. Moleskine - I use the large sketchbook (that's the one with the lavendar blue wrapper). 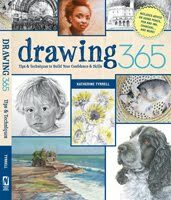 This contains 100 pages 250 gsm paper which has a super smooth surface (a bit like Bristol plate) which accepts both pen and ink and coloured pencils very well. I keep looking at the smaller version but I think that's just to small for me. Also I've never tried the watercolour sketchbook - but that's because it seems to have a NOT surface rather than an HP surface which is what I'm after for pen and ink and coloured pencils. Winsor and Newton - I occasionally use a Heavy weight Wire-O Sketchbook - which has a hard back and a spiral wire binding which means it can lie flat easily. However the wire binding means there's no scope for a double page spread sketch unless I get the case bound version. This also has 50 sheets of 170gsm/80lb acid free cartridge type paper with perforations for easy removal. They accept pencil, pen and ink and coloured pencils well. I've also used a waterbrush with watercolour pencils with this one and not had a problem. 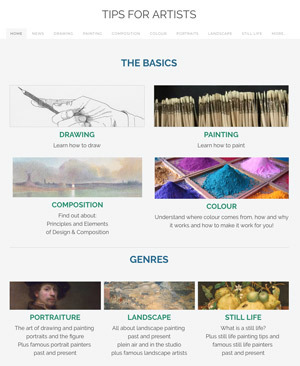 The cover does state it's suitable for watercolour while the website says suitable for light watercolour washes. I've also got a Fabriano Journal with the coloured ingres paper - but it simply doesn't open and lie fat easily and hence it never gets used! 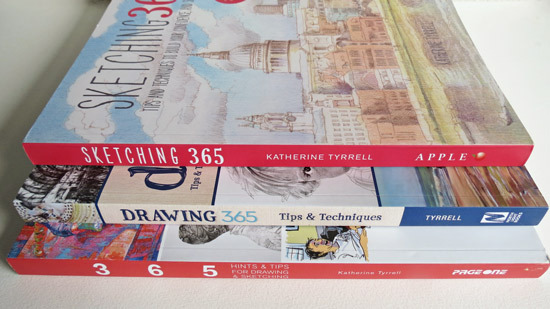 My final two sketchbooks you can't get anymore so I won't mention details here - but I would be interested in anybody who knows where it's possible to get a sketchbook with glassine interleaving like my Charmian Edgerton sketchbook has. OK - (and again I know we've done this before) but I still want to know which brand of sketchbook do you you use and why? Any new finds you want to tell me about? 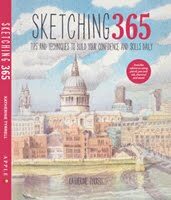 If we get a lot of answers or people would like to point me to where they have previously written about their sketchbooks, I'll do a summary post which includes all the links plus some sort of commentary as to which sketchbooks seem seem to find favour with regular sketchers. what media is it suitable for? would you change and/or recommend your sketchbook? C Roberson and Co has been manufacturing and supplying artists' materials since 1810. Just a quick note. 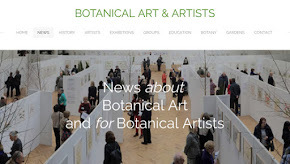 This is the website for C. Roberson & Co. - which took a bit of finding. Apparently they produce a lot of good quality art supplies - which probably needs investigating (big smile!). They only deal with trade direct at their base in north London. However they do have a map of artist suppliers around the UK which carry their supplies. 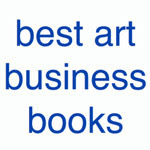 My favorite are Hand Book Artist Journals. 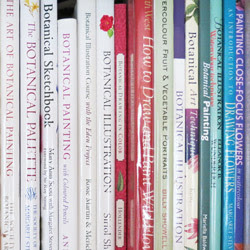 They're easy to find, online and in art stores. Here's a link to a picture of mine open to a sketch. I use them for watercolor, pencil, and pen and ink sketching -- and journaling on the right hand side. They are hand-bound sketch books with cloth covers. The 5" x 8" size I use is easy to take hiking, which I do a lot. These also come in other sizes. 128 buff colored blank pages, ribbon book mark and elastic band to keep it closed, clear plastic sleeve on the inside back cover. The paper has some tooth to it and heavy enough it doesn't buckle, unless you use lots of water. I don't like how slick the paper is in the Moleskine books; this is much better. I have learned to use the basic cheapest sketch book from Barnes and Noble - it costs less than $10 (U.S.) and has a sewn binding. But here is the key - I remove every third page - I do lots of collage and spray mounting in lots of layers and this is the only way the book does not pop. I use almost anything cheap and cheerful. 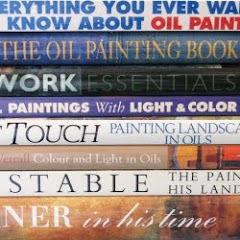 :) I don't generally paint in them though, although I have painted with acrylic in the Moleskins and similar good-quality cartridge books with no problem. I have a small moleskin and an odd size pound-shop version that's not quite A4. Plus a myriad of odd other little books people have bought me and the little passport sketchbooks from Muji which are a new favourite. I have a gorgeous white cracked leatherbound Barbara Higgins A5 book for writing rather than drawing. I also have something similar to the Daler Rowney which is the "main" sketchbook - on the whole it acts as a scrapbook for things I do in other portable sketchbooks and then cut out and paste into the hardcover one. I also have a Fat Pad for marker drawings, it's a heavy weight cartridge and spiral bound. It works very nicely and I do these for selling. For pastel sketches I usually just do them on pastel paper in the studio then cut and chop them to go in the hardcover. It's probably no help but when I was in Tokyo I had a lovely mulberry paper A3-ish size sketchbook that was spiralbound and the pages were perforated so they easily pulled out. It wasn't many pages, maybe 25? I no longer have it unfortunately so can't check what the brand was, I bought it in a big department store over there. I wonder if it's worth having a look in some of the Japanese department stores around Picadilly? Boy, I better get on the ball--I never even thought much about sketchbook options. I usually get something simple and cheap: usually Canson wirebound; 9x12 and 4x6; 65lb. I usually use only graphite. Maybe that's why I'm not using them as much. You know I use handmade sketchbooks with 140lb HP Fabriano Artistico Extra White paper, but I was very impressed with some large Sennelier sketchbooks Albany Wiseman was using at les Bassacs. I haven't seen anything like them on line, so will check the shop in Paris next month. I need paper that will really stand up to watercolor. I like a smooth surface for when I"m just drawing, too. Albany's books were filled with both wc and drawings and the paper didn't buckle! I liked the large and small- to- medium- sized books he had. Unfortunately, I didn't note any of the product details at the time. Hope I can find the books in Paris! you know I'm addicted to sketchbooks! heavy wire bound ones like the one you show, but mine are the square ones, about 11 inches square. I like these for the coast as they are just the right size and shape and I like the fact that I can fold them back on themselves and hold them easily. I use any medium in them so one page may be oil paint, the next charcoal and the next watercolour or pencil! or something collaged in. Mine are mostly by Pink Pig. There are old A3 Lindhurst wire bound sketchbooks from college days. I never seem to buy these now but the paper was nice and allowed you to use absolutely anything in them. then there are the Daler Rowney ebony hard back sketchbooks from A4 to A3. I'm currently using an A3 landscape and an A3 portrait format in these. Then there are the odd cartridge pads I've been given, the normal wire bound ones. I tend to use these as one offs and not keep them as a sketch book. Then there is a lovely little hand made paper book - pretty pretty - and a hand made paper book bought in a London craft market. Both of these are horrible to draw or paint in! so rarely see the light of day. Then there are some small 7x5 books with a sort of mock suede cover - bought cheaply in Asda and the paper is quite nice - but I don't normally work that small. So currently in use are the 2xA3 hard back books, a 10 inch square hard back book, one of the little Asda ones and my moleskine. I do like hard back books as they they are stronger and nice to use and to look through later. Same as viv...pink pig, but now I am addicted to watercolour moleskines, I have hundreds of old sketchbooks going back to when I was a nipper and the theme seems to be a nice hardback cover, lots of Daler black ones and for a while the marbley cover ones. I'm still looking for my ideal sketchbook though, since I've heard good things about the Hand Book Artist Journals that drb mentions I think I'll give them a try. Moleskine and Handbook. I like the Handbooks best. They are cheaper and have more paper. The Moleskines don't take watercolor too well. Here's a few pics from my Handbook Stoplight Sketches. My latest sketchbook which I've only had a very short while, is kind of neat. I had the link from one of the Yahoo Groups and ordered a Portable Sketchbook with Pockets. What I like about this sketchbook is the fact it has pockets for storing fresh paper and finished artworks. It has a sturdy plastic cover to use as a support while drawing or painting. You slip a piece of watercolour or drawing paper into the corner tabs on the inside cover, to hold the paper in place while sketching. The book is ring bound, so the cover can be flipped to the outside (back) to hold on your knees or table. As I said, I've only just received mine and used it once, but already I'm planning to take it on our next overseas trip in November! Click the right side of the page to Portable Sketchbook with Pockets. You can order different paper for it or simply use your favourite paper to fill the storage pockets. Somebody called "Unknown" has left a comment - which looks reasonable and has no links. However since I don't publish Anonymous comments I'm posting it. [quote]I find it curious that you like the Moleskine and W&N sketchbooks for pen and ink work: I find both tend to feather. the heavy weight W&N sketchbooks used to be great, but they changed manufacturers from Malaysia (blue cover) to China (black cover). now the binding (for the non spiral ones, obviously) is terrible, the paper is feathery/bleedy when used with pen and ink, and the perforations seem to always be crooked. the Moleskine Sketchbooks tend to have uneven paper for me. one page can be great for ink, the other will bleed/feather like crazy. plus, the no inkwash/watercolour thing makes it less useful to me anyway. I like the Fabriano Venezia sketchbooks as it has extremely heavy paper (Fabriano Accademia), but the binding is so tight you have to literally break the book's back to get it to lie open. the sewing is strong enough to keep it together but it looks awful. 28th October 2007: Who's made a mark this week? A Great Big "Thank You"
21st October: Who's made a mark this week? 14th October: Who's made a mark this week? 7th October: Who's made a mark this week?